If you buy something on the app store with a recurring payment, you’ll now be asked to tap to confirm it. 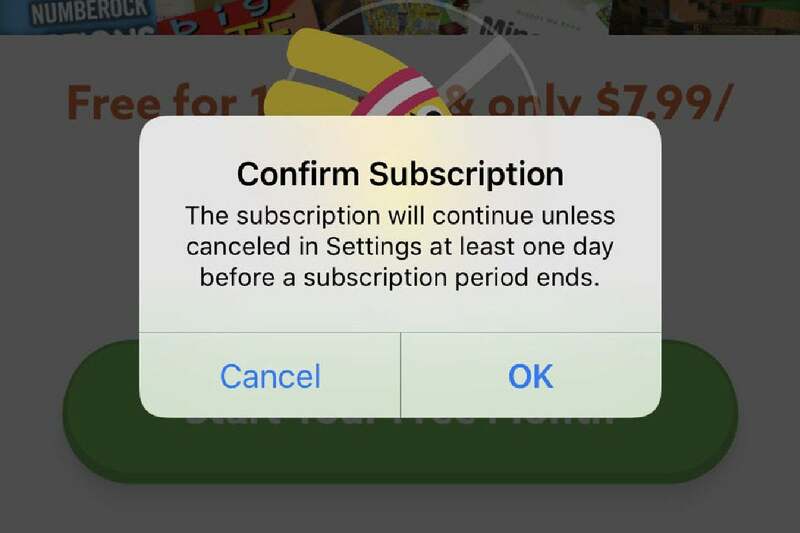 The subscription will continue unless cancelled in Settings at least one day before a subscription period ends. Apple has suffered a bad rash of subscription scams lately, with apps that contain seemingly reasonable in-app purchases that look like you’re buying a one-time thing, when in fact you’re buying a recurring monthly (or weekly) subscription. It’s easy to accidentally approve the purchase without looking closely enough to see what you’re agreeing to. The problem is exacerbated on devices with Touch ID, where users will sometimes press the home button to try to exit out of an app that offers a subscription, and instead approve the purchase. There have been a rash of apps lately that seek to exploit this behavior. This new confirmation dialog may be a little inelegant, but it should go a long way to curbing accidental and scam subscription purchases. This appears to be a server-side change, so it will work with all currently supported versions of iOS without any update needed. However, it may not have rolled out to everyone just yet. We attempted to test the feature with several devices and accounts and were never presented with the “Confirm Subscription” prompt. We hope it rolls out to everyone soon, but don’t be surprised if you don’t see it just yet.